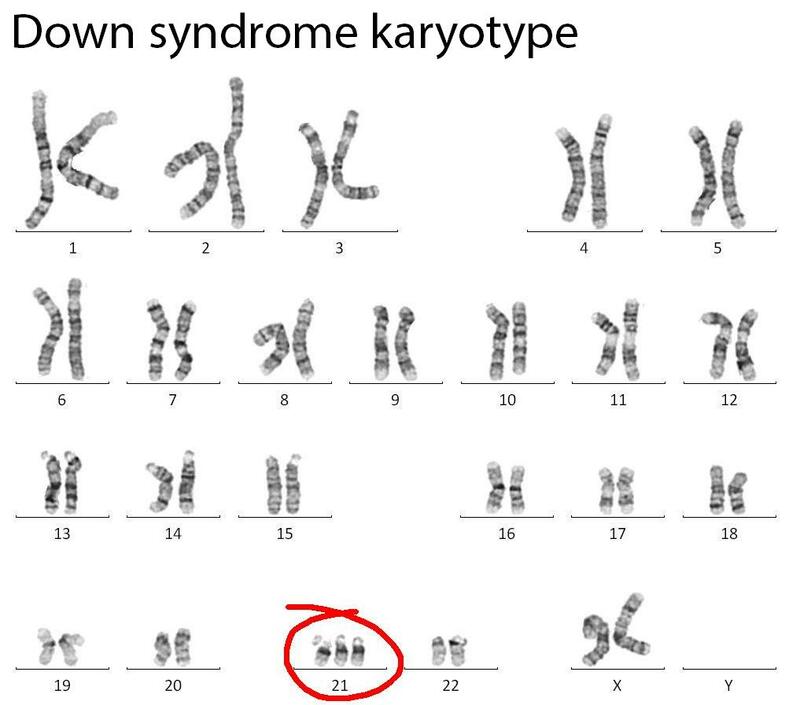 Down syndrome/trisomy 21: is a genetic condition where patients have 3 copies of the 21st chromosome. Note that in addition to non- disjunction, patients with Down syndrome can also have an extra 21st chromosome if one of the 21st chromosomes attaches abnormally to another chromosome. This is called translocation and can either be asymptomatic in the mother (e.g., mother has two 21st chromosomes, but one of them is attached to another chromosome, leading to the potential for trisomy 21 in the offspring) or can occur during rearrangement in meiosis. 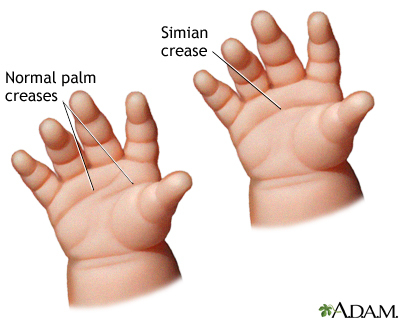 Down syndrome is a genetic disease resulting from a chromosomal abnormality. An individual with Down syndrome inherits all or part of an extra copy of Chromosome 21 (source). The presence of this additional chromosome will lead to a wide variety of problems which include: intellectual disability, congenital heart disease, and abnormal facial features (to name a few). family history of chromosomal translocation, increasing number of spontaneous abortions increases risk of all trisomies. *Ultimately genetic testing is the most useful with regards to confirming a diagnosis. 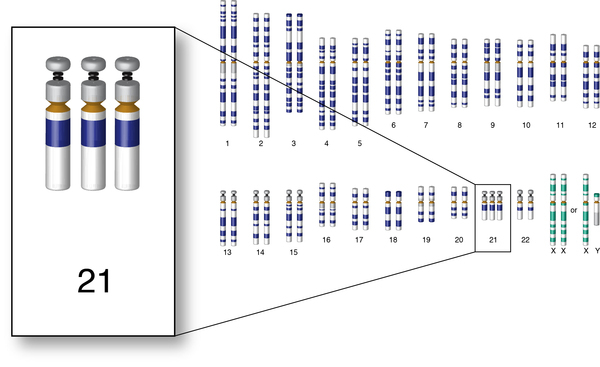 Most often (especially with the U.S) prenatal genetic screening will demonstrate this trisomy. Genetic testing for chromosomal abnormalities is very specific and can rule out the possibility of other diagnosis. Surgical treatment for cardiac abnormalities. 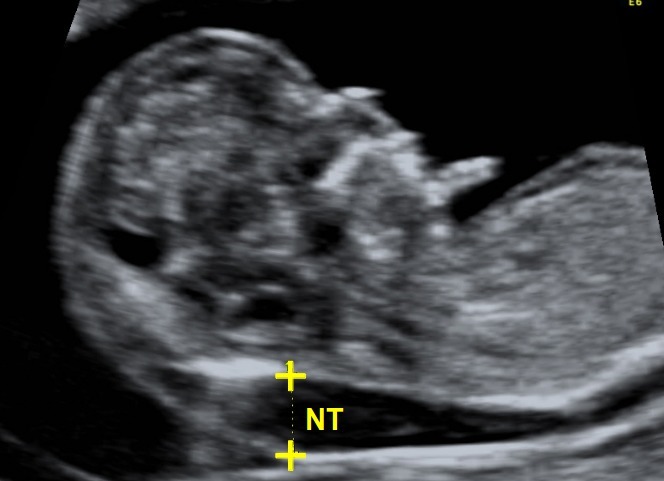 While this is a congenital condition, pre-natal genetic screening (chorionic villus sampling/amniocentesis) and ultrasound can help detect it prior to birth. Heart defects: AV septal defects (endocardial cushion defect) are the most common type of heart complication. VSD and ASD are also common. Atlantoaxial instability: this refers to mobility between the atlas (C1 vertebrae) and axis (C2 vertebrae) that can be seen in a fraction of patients with Down syndrome. Some patients with this condition are symptomatic and develop: leg spasticity, hyperreflexia, positive Babinski sign, and clonus.